There are good television shows, and then there are great television shows. There are good book adaptations, and then there are great book adaptations. But the rarest breed of all is the great book adaptation that makes for great television as well. One such example is HBO's Game of Thrones. If you've read the books, you'll enjoy the show all that much more, but even if you haven't, you'll love the intricate storyline. It's a well crafted fantasy drama - sort of the Sopranos meets Deadwood in Middle Earth. HBO has pulled out all the stops on budget, and with the second season starting in just a few weeks (and the first out on blu-ray), more fans will be coming on board. We haven't seen much in the way of collectibles, however. No figures have been announced of any kind, but Dark Horse Comics has picked up the license to do some odds and ends. There's t-shirts and coffee mugs of course, and some mini-busts should be coming out later in the year. 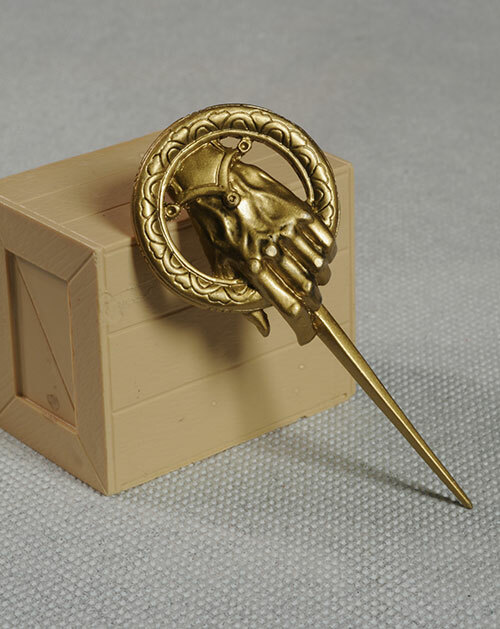 The only announcement I was excited about was the one prop replica - the Hand of the King pin. 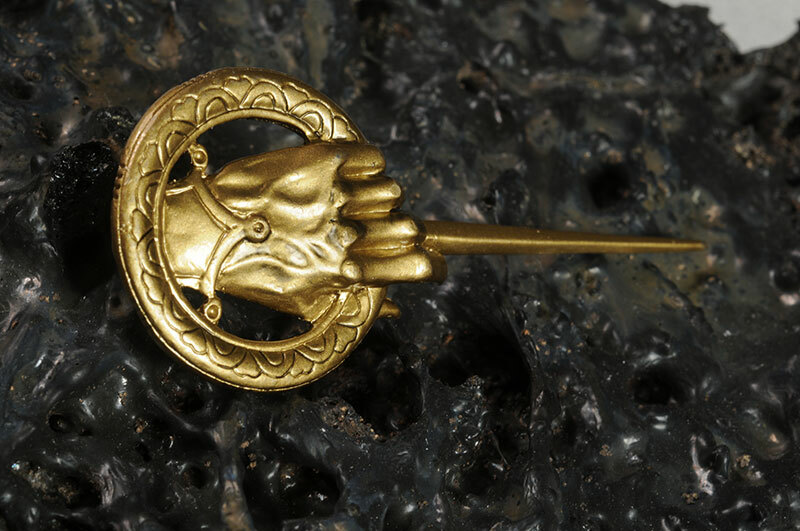 This pin is worn by the 'hand of the king', a poetic way of saying his right hand man. The version in the book is very different from the version on screen, and Dark Horse has wisely chosen to reproduce the television design. This pin has just started shipping, and has a suggested retail of $13. You should be able to find it for a couple bucks cheaper with a little effort. There's nothing particularly earth shattering about the package, but it's better than a simple box. There's an inner rubbery tray that holds the pin. Over that is a cardboard cover, and over that a plastic slip cover. 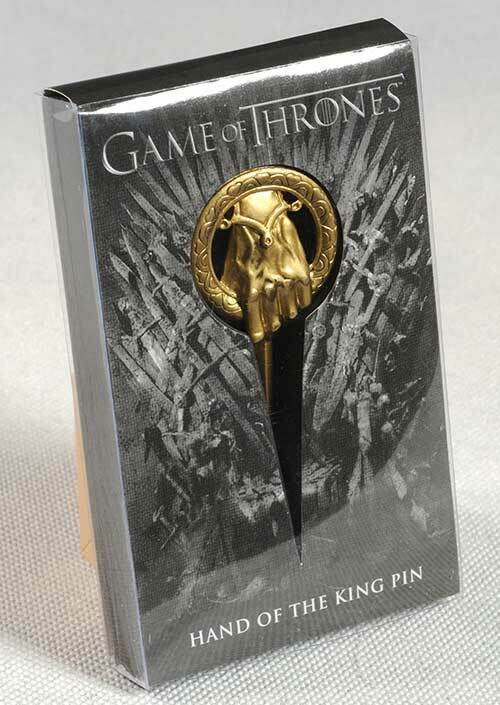 Obviously, it fits the definition of collector friendly, keeps the pin safe from bending, and doesn't take up a whole lot of room. Checking the real deal, it looks like they've done a very good job capturing the look of the pin. The replica is a bit more sharply defined, but that makes sense - the one on screen would be more worn from being passed down from generation to generation. There's some finely sculpted scrolling around the edge, and the hand is veined and aged. The scale seems about right, although that's probably the toughest thing to tell from photos. Considering how well the rest of the design matches, I'm going to give Dark Horse the benefit of the doubt on that one. The pin is about 3" long from top to tip. This pin is made from a soft metal - perhaps pewter. That gives is a nice heft, but it also means that the spike can bend slightly, and break under too much pressure. 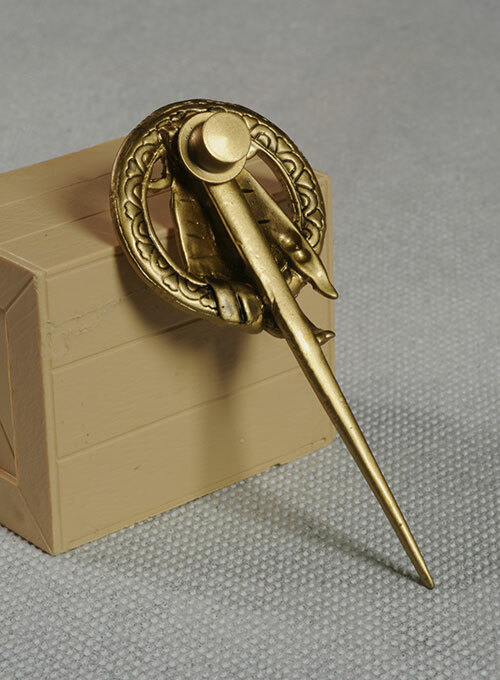 The brooch is held in place by a pin and screw cover in back. This cover is pretty big, and will push the pin out from your body further than I'd like. With such a large back to work with, I would have liked to have seen something a bit flatter used as the attachment. But the only real nit that pulls the score down slightly is the rough edges between the fingers and around the two extended fingers. This cheapens the overall look slightly, and reminds me of cast lead or pewter rather than the more expensive metal it's attempting to copy. While this isn't exactly an expensive bauble, it did hurt the score in this category a smidge. 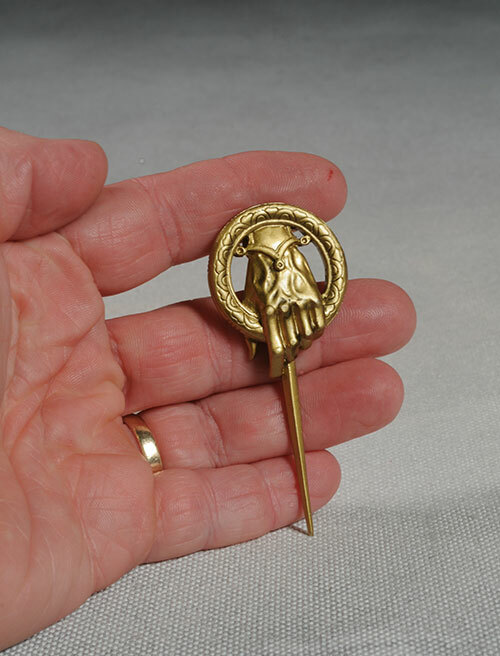 The pin has been given a brass plating, which appears to be very high quality. There were no rubs or inconsistencies, and it looks like it will hold up under normal handling. It's a little glossier than the actual prop appears, but that's a pretty minor nit. 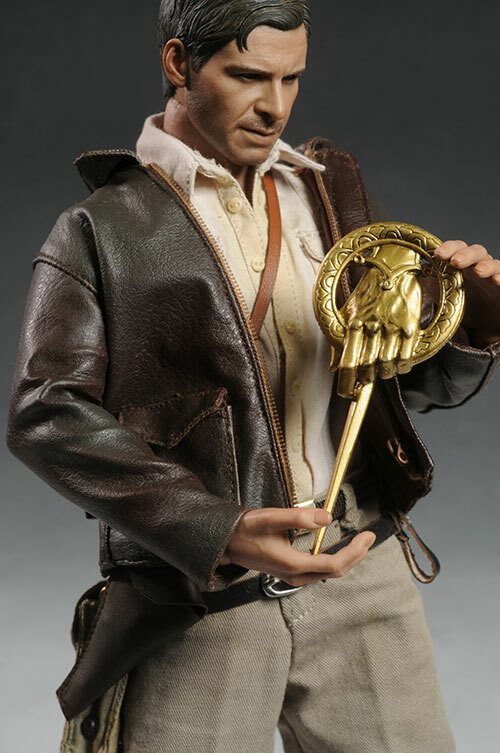 It's tough to get prop replicas - even small ones - in the ten buck range. Some places have this pin as cheap as $11, and that's a very solid value. Remember that the thin spike bends, and if it bends enough, it will break. I've been hoping for swords from the show, but as of yet there's nothing out there. They have done swords based on the book (and one was even featured on Big Bang Theory - I think they missed an opportunity by not having the guys argue about whether it was better or worse for it to be based off the books instead of the show), but I'm looking for show inspired goodies. 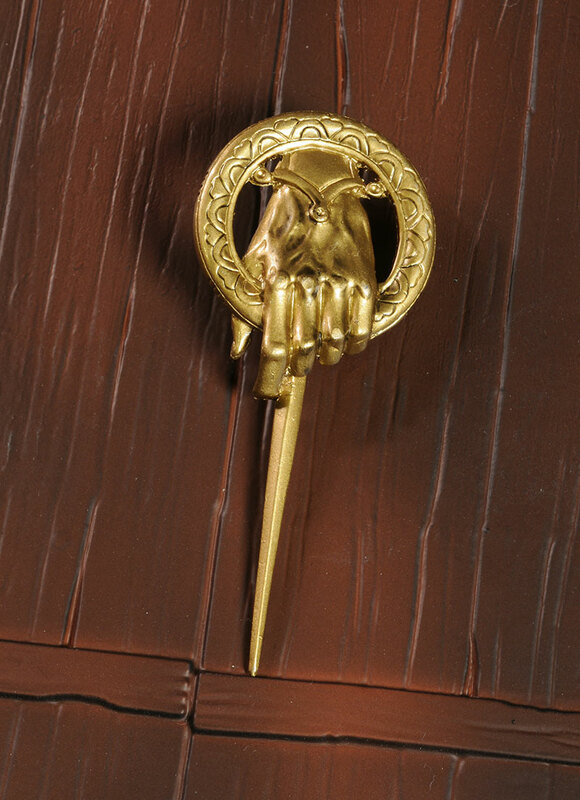 This pin does the trick, feeding my need for a show prop, and being something that is fairly key to the overall story line. Pop it on your shirt, and everyone will bow to your position - except for the King, of course. - has it for $11.69. - has it for $13. - Entertainment Earth has it at $13. 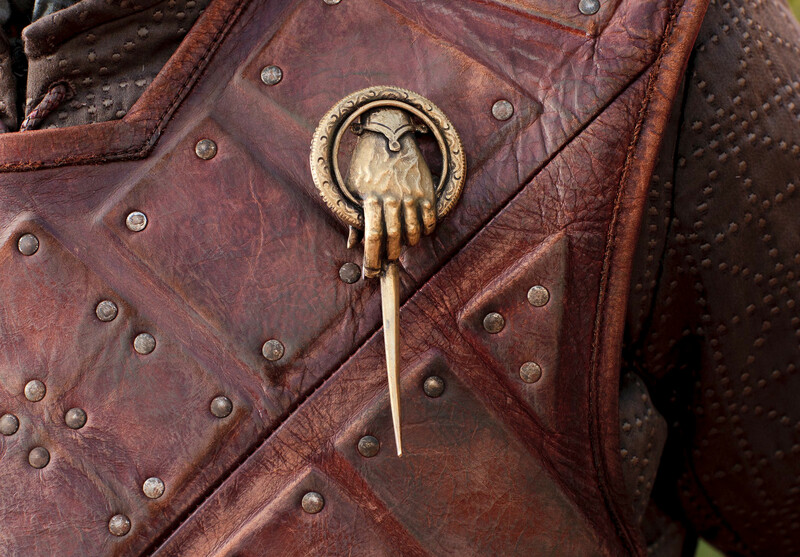 Sadly, we haven't gotten any other Game of Thrones show merchandise yet, but there are busts planned, and I still hold out hope that someone will be smart enough to pick up the license for more replicas and figures.